Note: the above image's resolution has been reduced for purposes of faster loading into your web browser. 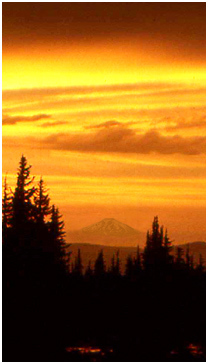 Image below is a pre-eruption image taken by me in June 1975 from Lookout Mountain (east of Mt. Hood)... The southeast side of St. Helens shows in this view, that was the side that the Shoestring Glacier occupied before it was destroyed by the eruption. This side of the mountain lacked the clean, graceful strato-volcano lines that made the mountain so famous from some of its other angles. 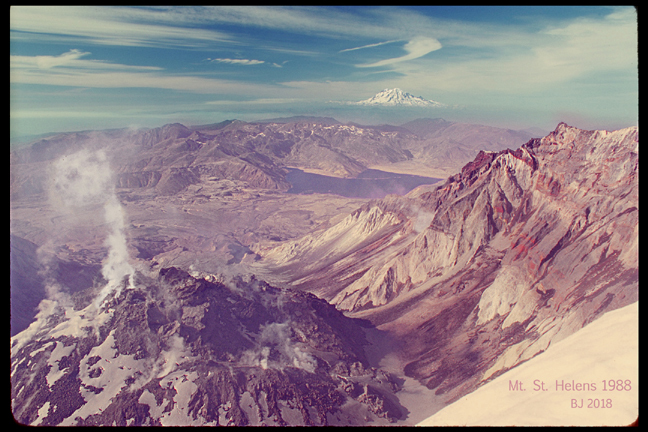 "St. Helens Smoking Crater" Sizes available are 8x12 and 16x24. 8x12 prices are $28.00 plus shipping for a premium print. Contact: brucej@Oregonphotos.com --Specify print #09).